Accepted Scientific Name: Echinocereus polyacanthus subs. pacificus (Engelm. ex Orcutt) Breckw. Origin and Habitat: Echinocereus mombergianus is endemic to the Sierra San Pedro Martir, in the Mexican state of Baja California Norte. Type locality: Hidalgo Observatory, Baja California, Mexico, 1900-2800 metres above sea level. Habitat and Ecology: This species occurs in temperate forest in the Sierra de San Pedro Martir (Parque National Sierra San Pedro Martir). In very sunny locations (it grow in the crevices of granite at the edge of a pine forest) spines are especially thick and strong. Nothing is known about the population size or trends. There is no information on the threats for this species. Description: Echinocereus mombergerianus is a caespitose cactus forming large cushions up to 70 cm in diameter, generally with 30-100 (150) individual shoots, branching from the base or side. The dull green stems are covered by yellow-brown spines and showy red flowers are freely produced in spring. 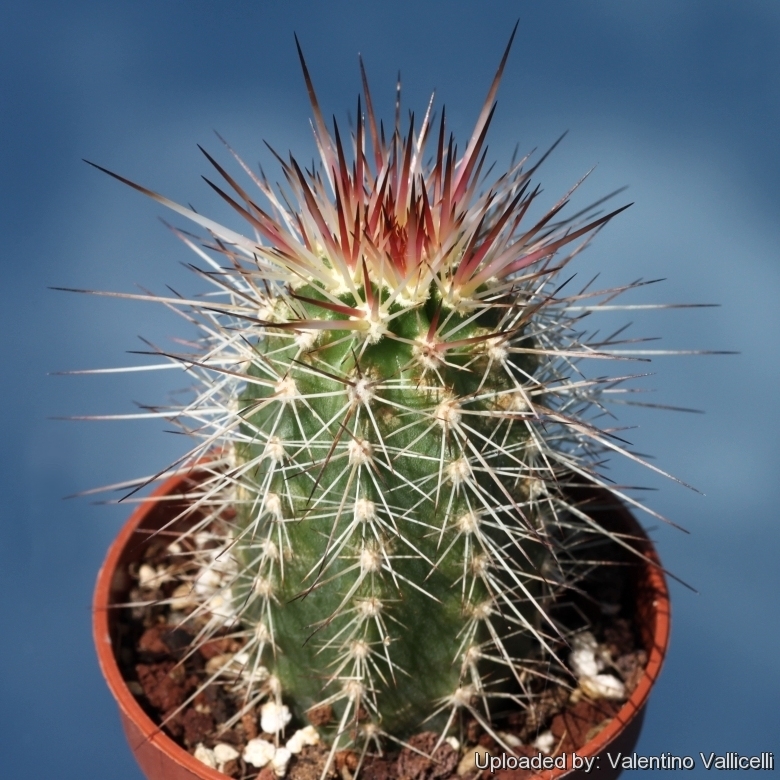 The taxonomy of Echinocereus mombergerianus is controversial, it is not certain if it is a local or morphological form of the very variable Echinocereus polyacanthus or of Echinocereus polyacanthus subs. pacificus, moreover some traits (The thick, fleshy petals, the floral-tube almost devoid of wool) get this species close to Echinocereus triglochidiatus. Stem: Cylindrical, mostly erect, 15-28 cm long, 3-5 (6) cm across light yellow-green to dull green. Ribs: (10-)11-12 (-13) slightly tuberculate, 8-12 mm apart. Areoles: Round, 3-5 mm in diameter, with a light beige to grey felt, about 10 mm apart. Central spines: 3-4, 30-80 mm long (in sunny locations occasionally up to 100 mm long), 0.3-0.7 mm in thick at the base, often somewhat angular, twisted and pointed, straight or up curved and spreading, longer ones pointing sidewards or slightly downwards, the new growth yellow to yellow-brown, sometimes brown, later horn coloured with yellow-brown tips. Radial spines: 8-12, 5-20 mm long, (0.2 mm maximum thickness), spreading, located mainly on the sides, straight, but also curved, light horn coloured with yellow tips. Flowers: Funnel-shaped, 4-5 cm long, 2.5-4 cm in diameter. Tepals 15 mm long and 3-4 mm wide, lanceolate, thick, fleshy, rusty-red to the orange-yellow, the receptacle with a slight green tint. Filaments yellow, sometimes light grey-violet. Anthers light grey-purple to grey magenta. Pollen straw-yellow. Style yellowish-white. Stigma lobes c. 9 , yellow-green. Flower tube 2.5-3.5 cm long and 6-8 mm in diameter, apple-green, smooth, with small round areoles, which bear little white wool and 8-9 spines mainly directed upward with brown tips. Each areola is subtended by a small fleshy scale. The flowers indeed are quite variable, sometime they are smaller or with two whorls of petals, or with filaments and anthers grey-magenta. Fruit: Small, oval (12 x 20 mm) with flower remnants (15-20 mm long) at first brown-green, then purple-red, later turning brown with round areoles about 1 mm in diameter with 8-12 thin white spines 6-10 mm long with brown tips, and a few very short curly white hair. Seeds: About 1.6 mm long and about 1.2 mm wide, black, shiny, divided into very low warts with weak cuticular folding limited to the edge zone. 1) León de la Luz, J.L., Gómez-Hinostrosa, C. & Hernández, H.M. 2013. Echinocereus mombergerianus. The IUCN Red List of Threatened Species. Version 2014.3. <www.iucnredlist.org>. Downloaded on 01 May 2015. 2) Frank G.R.W. (1989) "Echinocereus mombergerianus spec.nov. G.R.W. Frank - Eine sehr interessante Art aus der Sierra San Pedro Martir in Baja California del Norte." Kakt. u.a. Sukk. 40 (11): 272–277. 3) Frank G.R.W. (1990) "Nachtrag zur Erstbeschreibung von Echinocereus mombergerianus G.R.W. FRANK." Kakt. u.a. Sukk. 41 (11): 261. 9) Taschenlexikon der Farben, Musterschmidt-Verlag, Zurich-Gottingen, 1975 (2. Auflage).